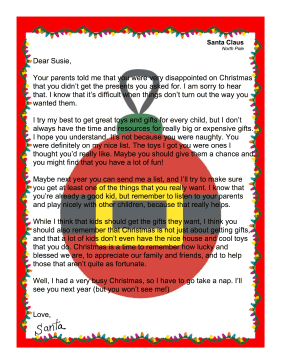 A great letter to give to a disappointed child on Christmas morning, this free Santa printable offers consolation before reminding the child of the true meaning of Christmas. Your parents told me that you were very disappointed on Christmas that you didn't get the presents you asked for. I am sorry to hear that. I know that it's difficult when things don't turn out the way you wanted them. I try my best to get great toys and gifts for every child, but I don't always have the time and resources for really big or expensive gifts. I hope you understand. It's not because you were naughty. You were definitely on my nice list. The toys I got you were ones I thought you'd really like. Maybe you should give them a chance and you might find that you have a lot of fun! Maybe next year you can send me a list, and I'll try to make sure you get at least one of the things that you really want. I know that you're already a good kid, but remember to listen to your parents and play nicely with other children, because that really helps. While I think that kids should get the gifts they want, I think you should also remember that Christmas is not just about getting gifts, and that a lot of kids don't even have the nice house and cool toys that you do. Christmas is a time to remember how lucky and blessed we are, to appreciate our family and friends, and to help those that aren't quite as fortunate.